Midsummer. Leading growths are shooting up at record speed, leaves are unfurling and mealy bugs and scale insects are the pests to watch out for during this time. They have a knack for lodging themselves in the centres of new growths, where their feeding causes chlorosis and misshapen leaves. I'm always excited by new roots and the roots of the Phalaenopsis in the greenhouse are wonderfully invasive at this time of year. If only we could have this sort of humidity right through the year. 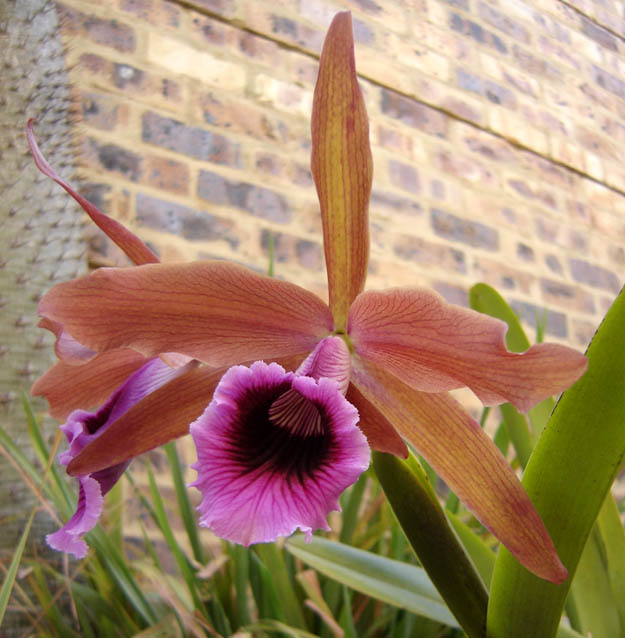 Laelia tenebrosa. 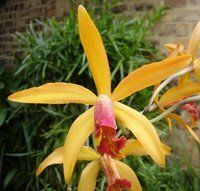 This gorgeous Brazilian Laelia produced two blooms from its sheath this year. The bronze colour is quite distinct, as is the dark throat. A lady of dark mystery, it's just such a pity that the flowers only last about two weeks or so. Laeliocattleya Mary Elizabeth Bohn. A nice blue cultivar. Blue cattleyas are notoriously difficult to photograph accurately. I've been told that this is because the colour is not so much a pigment as a scattering of light as it hits the epidermis cells of the petals, but I don't know how true this is. The flowers are quite iridescent, though. Dendrobium Dawn Maree x formosum. This is one of the most beautiful and impressive Dendrobiums I have ever come across. It is a blend of mid to high elevation Himalayan species from the Nigrohirsutae section of the genus. The canes all have a covering of minute black hairs. 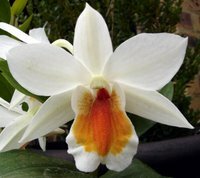 The huge waxy white flowers have pale green veins across the petals and a rather sensual vermilion blotch on the labellum. My plant produced three flowers from a node at the apex of the most recently matured cane. 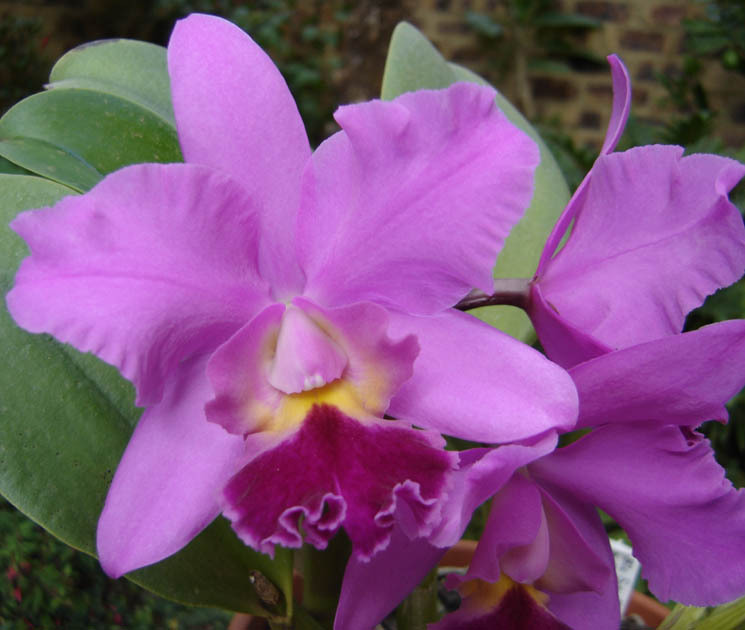 Laeliocattleya Ronselensis. This is a nice compact primary hybrid between Cattleya forbesii and Laelia cinnabarina. The tubular labellums of the star shaped tartrazine yellow flowers (what a lot of adjectives) appear as if painted with red pigment. 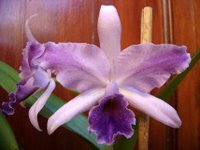 Brassolaeliocattleya Fritz Nickolaus x Angelwalker. This trigeneric hybrid has retained all the best characteristics of Cattleya walkeriana, which features prominently in its background. The large square column, intense cerise colour, compact growth and scent like attar of roses makes this a winner. they're so pretty! i think we need to go shopping again - i need something sleek, elegant, and easy... something that looks like it belongs in an uber-chic sushi restaurant. the kind of plant you usually keep on top of your tv cabinet? where do you find your discipline? my plant was a scrawny wreck this year due to my rejection. Well, for sleekness, nothing beats white Phalaenopsis, although every chi-chi Gothamite and her loft conversion buddy has one by now. You could also try hardcane Dendrobiums, which are my favourites for an Asian feel. Intergenerics from the Oncidinae, such as Adaglossum and Miltassia are quite hot in designer circles at the moment. Others I've always thought quite sleek are Miltoniopsis and small Laeliocattleyas, but for sheer impact nothing beats a well-grown Phragmipedium! What the hell is a dune pie?